Tucumán was still a small city in the north of Argentina, when Juan Bautista Alberdi was born on August 29 ., 1810. His mother Josefa Araoz, died two months later as a consequence of the problems she had in childbirth. For this reason Alberdi used to say, many years later, that birth was his first misfortune. Juan Bautista´s father, Salvador Alberdi, was a Basque merchant who had arrived from Spain a few years before. He settled down in Tucumán and lived in a big house where he installed a grocery store. Although Spanish traditions looked down on commercial activities and handiwork, Alberdi´s father devoted his life to trading. Consequently, Juan Bautista learned from his father that commerce was a dignifying activity. On the other hand, Alberdi´s family on his mother´s side, had been settled in America since 1611, when the first Araoz arrived in Tucumán also from the Basque province of Spain. This old ancestor of Alberdi´s arrived in Argentina many years before the Mayflower pilgrims disembarked in New England. This may be the cause of Alberdi´s belief that Argentina´s problems were not a fruit of its recent birth as a country, but a consequence of its defficient cultural formation. The long standing of his mother´s family in Argentinian territory, might have also provided him with a sense of security and solidity. According to the family, Alberdi´s mother, Josefa Araoz, was gifted in music and the arts. Juan Bautista inherited these natural qualities. Alberdi´s childhood must have been very sad, for he lost his mother soon after he was born and his father used to spend most of his time at the grocery store. He was brought up by his elder sister, Tránsito, his brothers Felipe and Manuel and……. the maid. His father died of a stroke in the Cabildo ( Town Hall in Hispanic America), while he was ready to vote for the concession of extraordinary powers to Bernabé Aráoz, gpvernor and relative of his wife. Juan Bautista, who was only twelve years old by that time, would admit many years later that his father liked Aráoz, although he was against dictatorship. After Salvador Alberdi´s death, Governor Bernabé Aráoz took charge of the orphans. But in 1824, when Juan Bautista was fourteen years old, Aráoz was overthrown and executed by Javier López, who was also part of the family, for he was married to Alberdi´s aunt, Lucía Aráoz. After this assassination, the new Governor Javier López protected the children and granted Juan Bautista a scholarship to study in Buenos Aires. It look the child about a month and a half to get to Buenos Aires in a narrow cart. Once in the city, Juan Bautista was admitted as a pupil in the Moral Sciences College (Colegio de Ciencias Morales); but soon he felt that his deep sadness kept him from studying and decided to leave school. When the Headmaster of the college accepted his decision, he stated that Juan Bautista had no aptitudes at all for intellectual tasks, except for music. After leaving achool, Juan Bautista worked as a clerk at a friend´s store, but soon he changed his mind and went back to college. Finally, he finished High School and attended University to become a lawyer. While studying in Buenos Aires, Alberdi was protected by Alejandro Heredia, who was a representative of Tucumán at the National Congress, from 1924 to 1926. As soon as Heredia went back to Tucumán, he overthrew and excecuted Alberdi´s uncle, Javier López. This violent event was a terrible shock for Juan Bautista. In 1834, before graduating as a lawyer, Alberdi returned to Tucumán. It was during the spring when the lilac flowers of the jacaranda trees witnessed his first love . However Alberdi decided to move to Buenos Aires, despite the romance and the offering of a job in Tucumán by the Governor. Back in the capital, and following his romantic temperament, he devoted his time to composing music (valses and minuets). He fell in love whit Petrona Abadía, had a child, but never got married. Meanwhile, dictator Juan Manuel de Rosas became the head of the national government creating an atmosphere of political violence and intolerance that made it impossible to develop any kind of political activity. Together with other young people, amongst whom were Esteban Echeverría, Miguel Cané and Juan María Gutiérrez, Alberdi founded the “Mayo Asociation” as well as a newspaper named “La Moda” (The Fashion”). But even these frivolous matters were considered dangerous by Rosas, who prohibited the publicaton of the paper. Forced to conspire against the government, these young intellectuals exiled themselves in 1838. Alberdi and Miguel Cané willingly settled in Montevideo, Uruguay. In their articles in the newspaper “El Nacional”, they encouraged General Juan Lavalle to invade the country and overthrow Rosas. But Rosas defeated Lavalle and this fact greatly discouraged Alberdi and his exiled friends. Altrough he was in love with Lastenia Videla, in 1843, he left for Europe where he spent his last savings. Without either money or hope of seeing his country liberated from the oppresor, Juan Bautista decided to settle in the port of Valparaiso, Chile. There he got a job as a journalist in the newspaper “El Mercurio” -which still exists- and validated his degree as a lawyer. Some years later, he became a successful attorney and was able to buy a country house in an elegant neighbourhood named “Las Delicias”. In 1852, Rosas was overthown by General Justo J. de Urquiza. Most of the expatriates, such as Domingo Sarmiento and Bartolomé Mitre, returned to Argentina, whereas Alberdi hesitated. After a couple of weeks, he made up his mind to stay in Valparaiso and write a book proposing a constitution and a program for Urquiza´s government. The book was named “Basic and Starting Points for Institutional Organization”. He suggested that the country should be ruled by a federate republican constitution. Alberdi considered that the country was not ready for democracy after three centuries´ struggle against colonial monarchy and dictatorship. At the same time, he thought that Argentina could not go back to monarchy since nobody would accept, as he said, “a marquis in his own neighbourhood”. Therefore, the only solution would be to establish a Republican government and educate the population so as to develop the chosen system. He thought that education and inmigration would change the country´s habits. Inmigrants would bring the sense of freedom and industry that Argentina lacked. But not any sort of inmigrants: Anglo- Saxons, in his opinion, would better provide these qualities. Regarding education, Alberdi suggested not to implement a humanistic but a technical approach. He used to say: “The country does not need lawyers but farmers to cultivate the land and workers to build roads and railways”. General Urquiza, who had also been an authoritarian governor in the province of Entre Ríos for ten years, believed in Alberdi´s theories. “If I accepted a public position, it would look as if I was seeking honours, money or a political position”. Years went by and Alberdi continued living in Chile, where he practised as a lawyer. He was still single but his intelligence, his manners and his passion for music made him very attractive to women. Matilde Lamarca, the daughter of an exiled friend, fell in love with him. The relationship was close to marriage when once again a political event frustrated his intentions. Buenos Aires had separated from the rest of the country and was about to declare its independence. Faced to these facts, Urquiza asked Alberdi to be his ambassador in Paris. Alberdi´s main task was to prevent Buenos Aires from being recognized in Europe as an independent country. In 1855, Alberdi accepted the post as ambassador, and left for Paris straight from Valparaiso. He sailed through the Pacific Ocean to Panamá. Once there, he went by train to the Atlantic coast and from there he sailed to La Habana and New York. He also visited Washington, where he met District Attorney Caleb Cushing and President Frankling Pierce, who anticipated that the United States would not recognize Buenos Aires as an independent nation. Althrough he only stayed one month in the United States, he profited by the visit. He studied the process of inmigration in North America, pluvial navigation, the federal system, customs and public lands legislation. Soon after writing these words, Alberdi arrived in England, where he could get support for his cause thanks to President Pierce´s recommendations. Then he settled in Paris ruled at the time by Napoleon III This king had been chosen President some years before by democratic means, but afterwards he claimed himself Emperor and ruled the country with a combination of political authoritarianism and free market economy. Alberdi kept to his austere and simple habits at the luxurious French court. In public receptions, Napoleon III used to ask him ironically: “How are military coups in South America today?”. Alberdi preserved Argentinian unity as Ambassador to France and England. In other words, he achieved his aim impeding the recognition of Buenos Aires as an independent state. He also travelled to Spain, where he could get the recognition of Argentinian independence, which had been declared in 1816 but had never been accepted oficially by that country. Rosas, the former dictator, was exiled in England when Alberdi met him. The situation had changed and Alberdi helped Rosas to overcome his economic difficulties aroused by the confiscation of his properties in Argentina. At Rosas´ daughter´s home, Alberdi met Josefa Gomez, a young widow very close to the ex dictator´s family. Juan Bautista and Josefa met later in Paris where they lived a public romance. Alberdi took her to an official reception at the Palais des Tulleries. She was dressed up in a bright red dress, the colour that identified Rosas´ political party. This fact triggered a terrible scandal in Buenos Aires and his political adversaries demanded his removal from the Embassy. The conflict between Buenos Aires and the Confederation ended in 1860 with the battle of Pavon. Bartolomé Mitre, who was the Governor of Buenos Aires, won the fight and took over the presidency of the republic. As soon as Mitre came to office, he removed Alberdi from his post. Disposessed of his position, Alberdi hesitated whether to return to his country, which he had left twenty two years before, or to stay in Europe. He also considered the possibility of going back to his country house in Las Delicias, Valparaiso, where he had learned the advantages of an inmigration policy. While Alberdi was trying to make up his mind, President Mitre, along with the governments of Uruguay and Brasil, declared war to Praraguay. Alberdi warned his fellow countrymen that the war was only a cover for Mitre´s military ambitions. Mitre considered himself a new Napoleón Bonaparte. Therefore, Alberdi decided to remain in Paris and work against the war in South America. He published four pamplets where he sustained that Paraguay had better rights than the allied forces. President Mitre, who commanded the allied troops, stated that Asuncion would be taken over in six months. He also accused Alberdi of being a traitor to the country´s cause. Paraguay finally surrendered and the war came to an end, but Mitre did not withdraw charges against Alberdi. Meanwhile, Matilde Lamarca, who had been Alberdi´s fiancee in Chile, married a man much older than her and went to live in Europe. Once in Paris, she restarted a friendship with Alberdi that did not end up until his death. Alberdi employed a French housekeeper, Angelina Dougé, who shared his room when he stayed in different hotels. In summertime, Alberdi would stay in Saint André de Fontenay, Normandy, where Angelina owned a house. 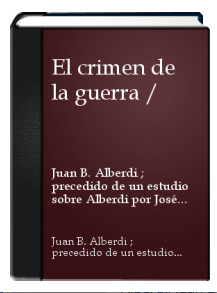 In this place Alberdi wrote his book “War as a Crime”. He wondered in this essay why a criminal should pay for his crimes in jail while leaders of the war, who pushed thousand of people to death, were cherished and glorified with monuments. He also considered that a country at war takes justice by its own hands without the mediation of a neutral third party. He claimed that war would be a crime as long as the affected countries did not subject themselves to the decisions of the international community. In 1874, Nicolás Avellaneda succeeded Domingo Faustino Sarmiento in the Presidency. The new President was the son of Marco Avellaneda, who had been a close friend and schoolmate of Alberdi´s. But although Alberdi could have returned to Argentina as soon as Nicolás Avellaneda came to office, he did not come back until 1879, when he was elected Deputy in the National Congress, representing the province of Tucumán. Alberdi was a legendary figure when he desembarked in Buenos Aires after forty one years´ absence. He had been exiled in Rosas´ period, he had created the program for the Constitution and he had been proscribed by Mitre because of his opposition to the war. A few months after being appointed deputy, a new peoblem aroused between Buenos Aires and the rest of the country: they disputed where the new capital city should be located. The President and most of the members of Congress went to the near town of Belgrano, where the question was solved by fighting. Alberdi, faithful to his pacifist principles, decided to remain in Buenos Aires. After the battle, the winners declared the expiration of the mandate of all congressmen who had stayed in Buenos Aires during the events. Although Alberdi was rspected and admired by most Argentinians, inclufing President Julio A. Roca, he was also deposed. He did not feel at ease in his own country, for he was an intellectual and found these political disputes frustrating and difficult to cope with. Besides, he missed Autumn in Paris which he liked as much as spring in Tucumán, his birthplace. He said: “After living for decades at the heart of civilized world, I understood that civilization has nothing to do with technology or electricity, but with tolerance to other people´s ideas”. He set off for Paris looking forward to meeting his housekeeper and his old friend Matilde Lamarca. But before the ship arrived in Burdeos, he suffered a stroke that inmovilized one of his legs. He stayed a few months recovering in Burdeos, and then he departed to Paris. Once in that city, the seventy one-year-old bachelor met Angelina, the housekeeper, who took him to her house in Normandy. He tried to recover there before going back to Paris, but the decline of his health was inevitable. His mind started to fail and his friend Matilde Lamarca decided to keep him at a sanatorium in Neuilly Sur Seine, near Paris. He died I in the morning of June 19, 1884. Angelina arrived from Normandy the following day and fainted in despair when she saw the lonely corpse of his beloved “Monsieur Alberdi”. In that loneliness died the man who created the institutional transformation of Argentina. His ideas made the country develop from religious intolerance to freedom of creed; from political authoritarianism to balance of powers; from economic statism to a free market economy; from chauvinism and xenophoby to an open inmigration policy. He was a man of contrasts. He never recognized the paternity of his son, but he was the father of modern Argentina. He was loved by many women but he never got engaged to any of them. He was the son of a secessionist Basque, but he sought for Argentinian unity as ambassador to Paris. He rejected Spanish values inherited from colonial times, but he worked to achieve the recognition of Argentinian independence by Spain. 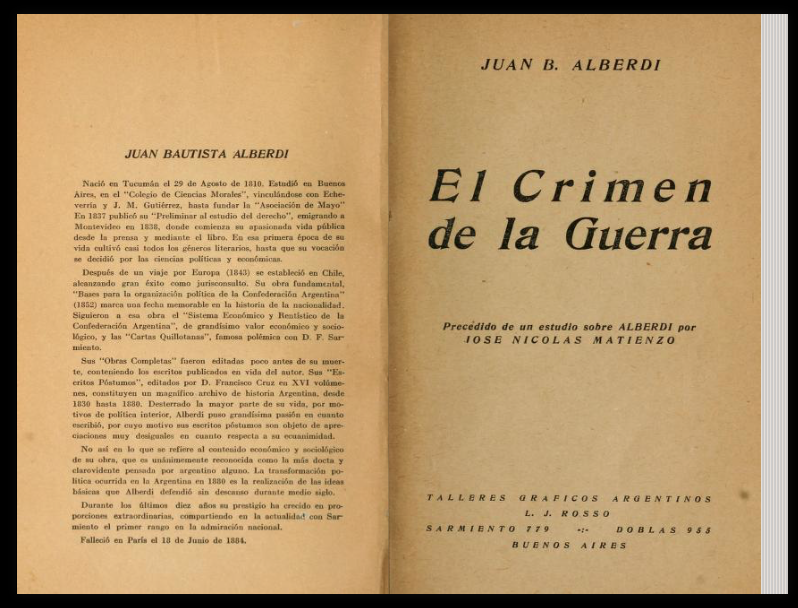 In times that glorified warriors and military people, Alberdi was a pacifist. It was once said that Alberdi used to seduce women by his music and men by his book “The Bases”. In spite of all his weaknesses, Alberdi still remains a charming character and one of the most outstanding men in Argentinian history.